X End option for step "4" denotes flying leads for cable. Cable type 1 is only for End A types 1-4 going to End B flying leads (X). Cable type 2 is only available for end types 1-4. Cable type 3 is only available for end types 5, 6 & Flying Leads. Cable type 4 is only available for end types 7, 8 & Flying Leads. 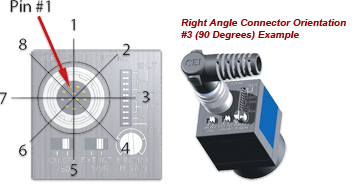 For connectors 7 & 8 the available right angle options are: 1, 3, 5, 7. *Connector P/N is for reference only.